Who is in charge of getting everything up and running? One of the problems associated with implementing anything within ICT is that someone is always responsible for getting stuff up and running. Even if a part of this is organised by an outside entity, there are still questions to be answered and information to be provided. Whether it be Google Apps for Education or the Ultranet, there is always some sort of administration issues. In some schools there is an ICT Coordinator or 21st Century Leading Teacher whose plate such rolls and responsibilities often fall upon. However, this is not the case in all schools. Therefore, it both needs to be made clear and equitable as to who is responsible and how they will be supported. Although the argument maybe that it makes teaching easier and allows for more focus on learning, at the start the most basic of tasks can take hours. Once things are up and going, who is responsible for maintaining the system? After everything is organised, the next question is who is in charge of maintaining things? This process involves many aspects, including ironing out bugs, sorting out passwords and other menial issues that always arise along the way with setting things up. Maybe Compass is different to the Ultranet and has rectified many of these challenges. However, one lesson learnt is that such issues can't simply be left to one person, there needs to be a team of people responsible for driving things. Interestingly, I recently heard Phillip Holmes-Smith speak about setting up his Student Performance Analyser. One of things that he suggested is that you need a group. Although there may be someone who oversees the whole process, they are there to finalise things and sort out problems, not simply do all the work, absolving other staff of responsibility altogether. What leadership is there around providing support and guidance for others? One of the really interesting things to come out of my post exploring the supposed digital revolution was the amount of people who referred to the failure to provide sufficient leadership as one if the key reasons for the perceived failure. This sense of leadership comes in many shapes and sizes, whether it be modelling best practise or coaching others about how to utilise various programs to aid pedagogy. Although many argue that change and reform needs to come from the bottom up, the failure to empower such roles from above often means that they are either considered as being insignificant or treated in a tokenistic manner. What expectations and requirements will be put in place to measure and maintain teacher take-up? Linked with leadership is a failure of staff to get on board. The lack of any care and urgency from those above can have the detrimental effect on those below. Too often this gives staff an escape clause. If they don't see it as important why should I? It is important to set clear expectations early for everyone. Attached to these expectations, there needs to be a plan about how things will be unfolded. One of the issues with the Ultranet was that it was realised in two phases where initially it was unclear exactly where things were heading as there were still aspects being designed and developed. I understand that this is the way things are and that there is no program that does not grow and evolve. However, it needs to be made clear from the beginning where things are heading and how the present situation relates to the future. What happens when the connection to the cloud goes down? The Achilles heal of the Ultranet, Compass, GAFE and so many other ICT products is the fact that they are online. Being in the cloud has many advantages, such as the ability to access it anywhere, anytime. However, it has one very big drawback. If the internet is down then Compass won't work. What is interesting with this is that most staff will question the program before they interrogate the infrastructure. For example, many jumped off Google Drive into Dropbox because the Internet was simply too unreliable. (+Corinne Campbell recently wrote an interesting post on a similar matter calling for more digital resilience.) What is sad is that the solution that many schools are going with in regards to the problem of the web is to pay for their own Internet, subsequently adding to the divide between those schools who can and cannot afford such resources. How will parents be introduced into the system? One of the big selling points for the Ultranet was that parents would be able to log in and gain access to different points of information, such as students assessment and attendance. The biggest challenge though was actually engaging parents in this process. Too often information evenings and pamphlets are done in isolation. To succeed there needs to be a multi-pronged approach to the pushing the benefits. This means running information sessions, providing hands on support, placing details in the newsletter and online, both on the school website and any social media platforms. This approach though needs to be tied together with a clear explanation of the benefits for students and their learning, for as Sir Ken Robinson suggested, "If there is no teaching and learning going on there is no education happening". 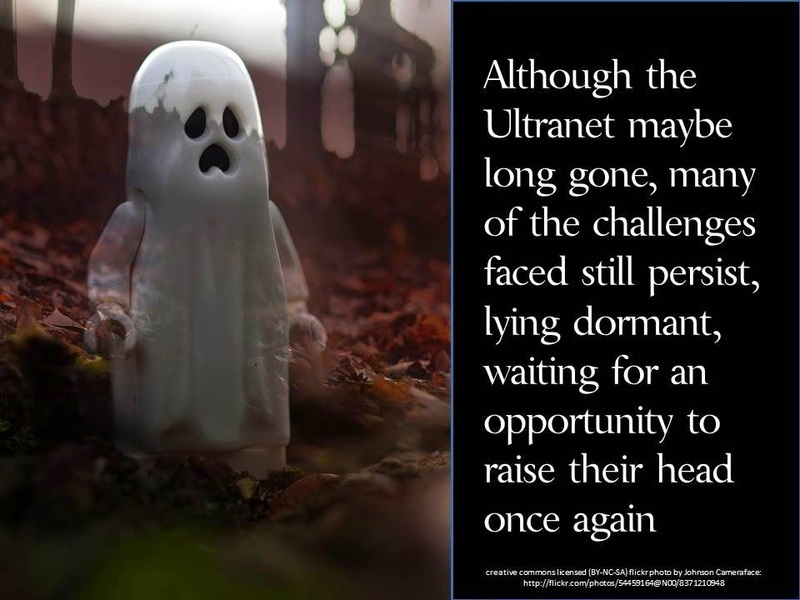 In the end, it is easy to pretend that all the challenges faced by the Ultranet belonged to the Ultranet. However, so many issues still persist, lying dormant, waiting for an opportunity to raise their head once again. The question isn't whether Compass provides a great potential to improve education, the question is whether schools are ready for these changes. That is the real question.